This study aims to explore the effect of ambient temperature on foraging the activity of Apis cerana and Apis mellifera colonies. We recorded ambient temperature, the time at which foraging commenced, worker thoracic temperature, and brood nest temperature at the same apiary in Kunming, China. We found that A. cerana start foraging earlier and at lower temperatures than do A. mellifera. A. cerana foraging (departures per minute) also peaked earlier and at lower temperature than did A. mellifera foraging. At the same ambient temperature, departing A. mellifera foragers and workers sampled from the brood nest had a higher thoracic temperature than departing A. cerana foragers and brood nest workers. A. mellifera colonies also maintained their brood nest temperature significantly higher than did A. cerana. Our results suggest that the larger A. mellifera foragers require a higher thoracic temperature to be able to forage. Financial support was granted by Key Laboratory of Tropical Forest Ecology, Xishuangbanna Tropical Botanical Garden, Chinese Academy of Sciences and Yunnan Agricultural University of China. 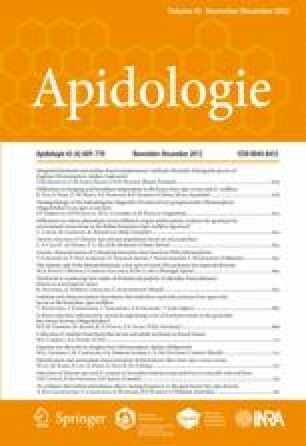 Différences de température, pour le butinage et dans le nid à couvain, entre les abeilles Apis cerana et A. mellifera.